The horror RPG Baroque was recently remade by Sting for release on PlayStation 2 and Wii. The soundtrack was completely rewritten for the remake by Dept. Heaven veteran Shigeki Hayashi to mixed reaction. On the one hand, many mainstream gamers enjoyed the atmospheric blend of rock, electronic, choral, and orchestral tracks featured on the soundtrack. On the other, series’ purists felt disappointed that Masaharu Iwata didn’t return to arrange his personal favourite work of his career. 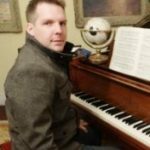 Though using an in-house composer proved more commercially viable for Sting, it was a blasphemous decision comparable to rejecting Akira Yamaoka from Silent Hill: Silent Memories. The resultant score was nowhere near as deep or creative as its predecessor, but can it still be enjoyable? The opener “Pulse of Steel” is pretty short, but gives an idea of the type of soundscapes to expect from the soundtrack. It tries to create an ethereal feel with its electronic focus and excess reverb, though the result comes across a little insincere. The string motifs, backing chorus, and percussion all add to the atmosphere, but still don’t offer any real substance. The approach is exactly that of a competent craftsman, not an inspired artist like Masaharu Iwata’s score. “Sinful Eyes” subsequently juxtaposes the electronic sound with hard-edged rock riffs. The showy electric guitar work is certainly entertaining, but not for the right reasons; it attempts to belt out an anthemic melody out of very lame material and the result is cringe-worthy rather than cool. The tour of the general sound for the soundtrack can be completed with “The Crimson Sky”, a much more ambient track featuring piano punctuation, warm string work, and even more synth choir. It’s no doubt beautifully mixed, but it serves more as scenic background music than anything psychologically affecting like the original Baroque and other great horror scores. Although the approach to the soundtrack is distinct, Shigeki Hayashi nevertheless makes some references to Masaharu Iwata’s original score. “Stagnating Flow” and “Endless Redemption” are definite throwbacks to the pulsating and percussive features of Iwata’s opener “Great Heat 20320514”. While both are rhythmically compelling, the development of the former is a little too short-lived and the latter sounds unintentionally lyrical; the result are pieces that are hardly as haunting as their inspiration and merely serve as aseptic yet slightly catchy background music. “Innocence” is an especially obvious example since it features the noises of babies laughing and crying just like the original’s “Little”; although the voice samples seem more like a tagged-on novelty, the actual instrumentals are probably better done in the remake theme for once given the touching melodic progressions and dynamic development. Probably the weakest tracks on the scores are those that aspire to noise music of the original. Tracks like “The Wriggling One”, “Voice from Abyss”, and “Chaos” each have some interesting ideas, but the majority are so unrelated that the end result sounds bizarre at best, ridiculous at worst. While the soundtrack is less emotional than intended, it does have its more affecting parts. For the more introspective moments, the piano work in “Spilling Tears” inspires sorrow and agitation with its augmented melodic progressions and dissonant chord use. Meanwhile the haunting synthesis of the chorales “Conflict” and “Wish” works wonderfully in context and “To One” sounds like an awe-inspiring orchestral homage to Iwata’s “Multiplex”. Those looking for more aggressive sounds should also find the industrial rock influence of “Groan of Metal” and “Frenzy and Noise” quite good; while their individual elements are unimpressive, they come together in such a way to offer compelling rhythms regardless. At the end of the soundtrack, “Invitation to the Future” reunites the thematic and stylistic threads of the score into one impressive blend and the result is probably the highlight of the score. While melodically and emotionally more appealing than the other tracks, even this one is damaged by derivative features, especially the layman string writing. Perhaps to compensate, the bonus track “Blank: Pain” aspires to romantic composers with its violin and piano solos. Ironically, this time the deficiency lies in the vapid electronic backing and its underdevelopment. 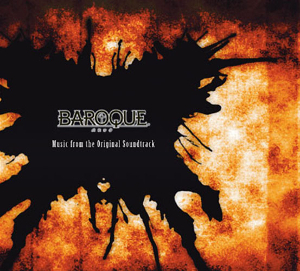 For all its limitations, Baroque the Original Soundtrack is still a professional production. Shigeki Hayashi does a good job mixing a number of elements together to achieve a distinctive and atmospheric sound. The individual elements are treated in a very derivative way, but at least the final result tends to be more interesting. There are also genuinely quite a few highlights and strong melodies along the way. The soundtrack falls down when approached as an artistic experience, however, and this is a major reason why comparisons with Iwata’s soundtrack are so damaging. The score really would have been so much more interesting as a musical experience had Masaharu Iwata returned to arrange and expand his gem. Those familiar with the predecessor are likely to find the remake soundtrack disappointing. However, those approaching the soundtrack as an all-new experience will probably find it a more enjoyable. Given it is so derivative, it is undeniably more accessible too and may appeal to those who found the original Baroque a little too out there.